Trebonianus Gallus (Latin: Gaius Vibius Afinius Trebonianus Gallus Augustus; 206 – August 253), also known as Gallus, was Roman Emperor from June 251 to August 253, in a joint rule with his son Volusianus. Gallus was born in Italy, in a family with respected Etruscan senatorial background. He had two children in his marriage with Afinia Gemina Baebiana: Gaius Vibius Volusianus, later Emperor, and a daughter, Vibia Galla. His early career was a typical cursus honorum, with several appointments, both political and military. He was suffect consul and in 250 was made governor of the Roman province of Moesia Superior, an appointment that showed the confidence of Emperor Decius in him. Anxious to secure his position at Rome and stabilize the situation on the Danube frontier, Gallus made peace with the Goths. Peace terms allowed the Goths to leave Roman territory while keeping their captives and plunder. In addition, it was agreed that they would be paid an annual subsidy. Reaching Rome, Gallus' proclamation was formally confirmed by the Senate, with his son Volusianus being appointed Caesar. On June 24, 251, Decius was deified, but by July 15 Hostilian disappears from history—he may have died in an outbreak of plague. Gallus may have also ordered a localized and uncoordinated persecution of Christians. However, only two incidents are known to us: the exile of Pope Cornelius to Centumcellae, where he died in 253 and the exile of his successor, Pope Lucius, right after his election. The latter was recalled to Rome during the reign of Valerian. Radiate of Trebonianus Gallus. Legend: IMP. CAIO. NIB. TREB. GALLVS AVG. Like his predecessors, Gallus did not have an easy reign. In the East, an Antiochene nobleman, Mariades, revolted and began ravaging Syria and Cappadocia, then fled to the Persians. Gallus ordered his troops to attack the Persians, but Persian Emperor Shapur I invaded Armenia and destroyed a large Roman army, taking it by surprise at Barbalissos in 253. Shapur I then invaded the defenseless Syrian provinces, capturing all of their legionary posts and ravaging their cities, including Antioch, without any response. Persian invasions were repeated in the following year, but now Uranius Antoninus (a priest originally called Sampsiceramus), a descendant of the royal house of Emesa, confronted Shapur and forced him to retreat. Uranius proclaimed himself emperor, however, and minted coins with his image upon them. On the Danube, Scythian tribes were once again on the loose, despite the peace treaty signed in 251. They invaded Asia Minor by sea, burned the great Temple of Artemis at Ephesus, and returned home with plunder. Lower Moesia was also invaded in early 253. Aemilianus, governor of Moesia Superior and Pannonia, took the initiative and defeated the invaders. ^ In Classical Latin, Gallus' name would be inscribed as CAIVS VIBIVS AFINIVS TREBONIANVS GALLVS AVGVSTVS. ^ Potter (2004), pp. 247–248. ^ Cambridge Ancient History, pp. 39–40. ^ Potter (2004), p. 248. ^ a b Cambridge Ancient History, p. 40. ^ Cambridge Ancient History, p. 636. ^ Potter (2004), pp. 248–249. ^ Potter (2004), pp. 249–250. ^ a b Potter (2004), p. 252. ^ See Bray (1997), p. 38, for both versions of the story and their sources. ^ The Cambridge Ancient History, p. 41. ^ Bray (1997), p. 38. Bowman Alan K., Garnsey Peter, Cameron Averil (ed.). The Cambridge Ancient History: The Crisis of Empire, A.D. 193–337, Cambridge University Press, 2005. ISBN 0-521-30199-8. Potter, David S. The Roman Empire at Bay AD 180–395, Routledge, 2004. ISBN 0-415-10058-5. Year 251 (CCLI) was a common year starting on Wednesday of the Julian calendar. At the time, it was known as the Year of the Consulship of Traianus and Etruscus. The denomination 251 for this year has been used since the early medieval period, when the Anno Domini calendar era became the prevalent method in Europe for naming years. Year 253 (CCLIII) was a common year starting on Saturday of the Julian calendar. At the time, it was known as the Year of the Consulship of Volusianus and Claudius. The denomination 253 for this year has been used since the early medieval period, when the Anno Domini calendar era became the prevalent method in Europe for naming years. Valerian, also known as Valerian the Elder, was Roman Emperor from 22 October 253 AD to spring 260 AD. He was taken captive by the Persian Emperor, Shapur I, after the Battle of Edessa, becoming the first Roman emperor to be captured as a prisoner of war, causing shock and instability throughout the empire. Marcus Julius Philippus, also known commonly by his nickname Philip the Arab, was Roman Emperor from February 244 to September 249. He was born in Arabia Petraea, the Roman province of Arabia, in a city situated in modern-day Syria. He went on to become a major figure in the Roman Empire. After the death of Gordian III in February 244, Philip, who had been Praetorian prefect, achieved power. He quickly negotiated peace with the Persian Sassanid Empire. During his reign, the city of Rome celebrated its millennium. 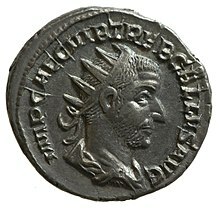 Aemilianus, also known as Aemilian, was Roman Emperor for three months in 253. Hostilian was Roman emperor from July to November 251. Hostilian was born to Decius and Herennia Etruscilla at an unknown date and elevated to Caesar in May 251 by Decius, the same month as his older brother, Herennius Etruscus, was raised to co-emperor. After Decius and Herennius Etruscus were killed at the Battle of Abritus, an ambush by the Goths, Trebonianus Gallus was proclaimed emperor by the legions. Almost immediately, he elevated Hostilian to co-emperor and his son, Volusianus, to Caesar. Hostilian died in November 251, either due to plague or being murdered by Trebonianus Gallus. Volusianus, also known as Volusian, was a Roman Emperor from November 251 to August 253. His father, Trebonianus Gallus, became Roman Emperor after being elected in the field by the legion, following the deaths of the previous co-emperors Decius and Herennius Etruscus. Trebonianus Gallus raised Hostilian, the son of Decius, to augustus, making him his co-emperor in June 251. Volusianus was elevated to caesar in the same month. After the death, or murder, of Hostilian in November 251, Volusianus was raised to augustus, co-ruling with his father. The short reign of Trebonianus Gallus and Volusianus was notable for the outbreak of a plague, which is said by some to be the reason for Hostilian's death, the invasion of the Sasanian Empire, and the raids of the Goths. Volusianus was killed alongside his father in August 253 by their own soldiers, who were terrified of the forces of the usurper Aemilian which were marching towards Rome. The Battle of Nicopolis ad Istrum was fought between the Roman army of Emperor Decius and his son Herennius Etruscus, and the Gothic army of King Cniva, in 250 CE. The Romans were victorious.